I'd planned to stop somewhere near Hawick (pronounced "Hoy-k" for reasons unknown to me) tonight. That's a distance of 100 miles from Callander where we are this morning. That means we are in no rush and as such there are 2 places I'd like to see that are pretty much "en route". There are The Kelpies and The Falkirk Wheel and to take these in will only add 10 miles to our trip. There's a wee nip in the air and a heavy dew on the ground this morning. Part of me is looking forward to seeing these 2 tourist attractions and another part of me is not. They are tourist attractions and tourist attractions are - well - inevitably filled with tourists. Firstly I don't like crowds although this being a Monday I'm hoping there won't be any crowds. Secondly I don't like the idea that I'm a tourist. It's a self perception thing, I have romantic notions that I'm some far out traveller seeking out enlightenment not just another camera clicking holidaymaker who is too tight to use a car. The truth hurts my delicate self image but I am really just another camera clicking holidaymaker who is too tight to use a car. Damn. The sun is up and the air is still which means the midges are out and I am definitely on the menu this morning. After 5 minutes of swatting and scratching I finally succumb and I have to put my jumper on and my head net. Did you know only the female midges bite, in search of nutrients and energy rich blood for the act or procreation. Male midges are harmless and quietly go about their business bothering no-one. I shall leave you to draw your own conclusions from that statement. Pffffft. We are out of the hills now and into the ordinary. The A84 soon becomes the M9 and I'm back to cruising at 50 to 55 mph with Mark riding patiently behind me. The mountains have gone and now we are seeing either farmland, towns or industrial units. I am just slightly sad to have left the Highlands, luckily today is a fine day and the riding is easy once more so I am just thankful that I am well and the bike is well too. Ah, junction 6, that's the one we want. Yep, The Kelpies is a tourist attraction. I had wrongly expected that they were just there, in a park perhaps or a grassy knoll on the edge of a council estate. What we find is a very polite and friendly car park attendant wanting us to pay £1 for parking, a visitor centre and a short walk to The Kelpies in a large open area with burger vans and ice cream vendors. The burger vans are closed being a quiet Monday morning although there are still a few people around. There is also a building site where soon will be more shops in the name of maximising returns from those who spend their way to happiness while away from work. "We create this art because we want your money"
Despite this commercialism I have to reluctantly admit The Kelpies themselves are - ahem - rather impressive. I don't do art and the purpose or the meaning of having 2 massive horse heads made of metal makes no sense to me whatsoever. I'm sure there will be a plaque somewhere that will inform me of the artist's angst while awaiting inspiration, the social rhetoric of the duality and anti-conformism expressed so deeply in the dynamic of their realisation. The cohesion of metal and skies, the interrelationship of the builder and the visualiser. It's all a load of tosh to me that makes a mockery those with real talent. The scale is imposing and the engineering is exemplary. The Kelpies. Nope. I'm impressed with the builders. I'm taken by the scale of the things. 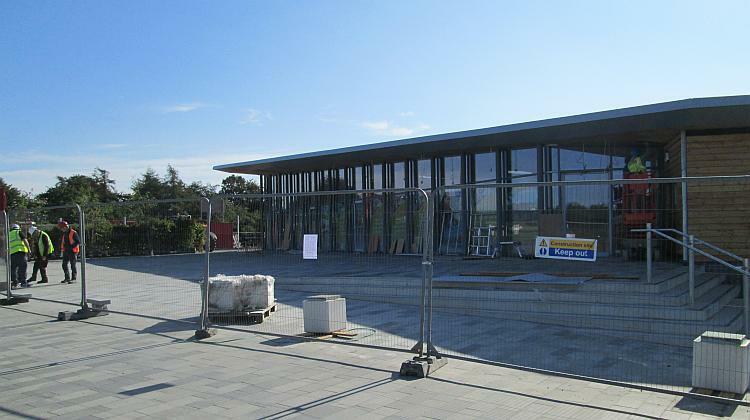 I like the steel frame beneath their metal cladding. I like the way the canal comes under the motorway then right in front of the heads. I am taken by the quality of the engineering both of the heads and their surroundings. All the credit should go to the real craftsmen here, those that built it not the pretentious people who came up with words to justify their existence. More staggering engineering next to more buildings designed to make you spend spend spend! We are fortunate to see the wheel in action. A boat filled with day trippers and holidaymakers shuffles it's way into the lower gondola and we wait patiently as barriers rise. Eventually and slowly the wheel starts to move, the bottom becomes the top and vice versa. Sure enough out comes another boat filled with day trippers and holidaymakers which shuffles around and parks up where the other boat left off. 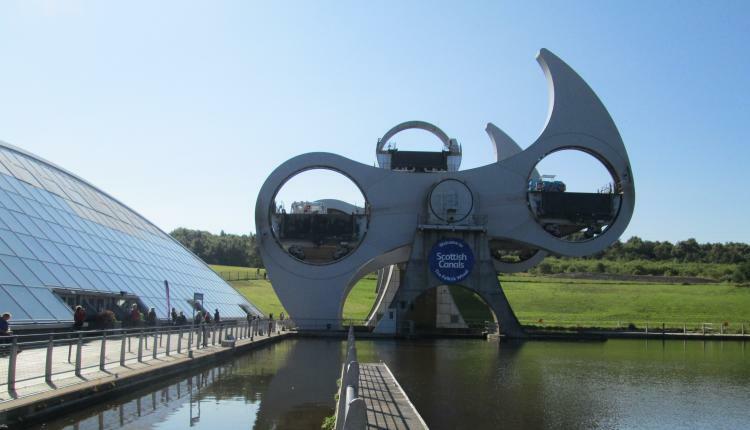 Such is the world of the Falkirk Wheel and it's commercial success. Well I've been and I've seen so we head off. After spending our hard earned pennies at the commercial giant of Tesco we get back onto the motorway and back to the business of being elsewhere. My thoughts now are disheartened by the experiences I've just had. I had hoped both places were just "there" for people to take in if they so wish. I might have been happy with a solitary ice cream van serving the kids or a little local cafe offering refreshment for the thirsty passer by. I didn't expect both of them to resemble theme parks or cheesy coastal resorts in their wholesale exploitation of tourists. I've been and I've seen and I've learned. The A7 takes us back into the countryside once more and away from the towns. We only stop to purchase some refreshment in Hawick, the day is young and once again the miles are easy so we head back out of town and south towards Langholm. There's a cafe and a campsite in Langholm and I think that would be an excellent place to stop. We can have a brew, maybe a bite to eat and then set up camp for the evening. Camping in Langholm also means the ride home will be a simple 120 mile run down the motorway and home. As I pull in to Whitsheil cafe it looks disappointingly closed. The sign in the window tells us that they close at 1700 most bays except Mondays, well, they close a little early at 1500 and it's 1530. Argh! I have that taste in my mouth of hot strong tea and a bacon butty with lashings of brown sauce. It is not to be sated, curses upon this cruel world. I have a hollow feeling inside that can only be filled with crispy bacon. Mark is also speaking of going home rather than stopping. I mean we're only 120 miles from our deep comfortable beds, the privacy of our own toilet and the ease of a kettle. Hell we could even make our own bacon sandwiches. Then I recall this winter when I had to run home from Scotland due to a forthcoming snow storm. No, no I shall stay here and have a final evening before I am forced to return home to earn some more money. The thought of my own bed it tempting but this trip is not over yet. Mark decides to head off, I think his new airbed is not all he'd hoped it would be. 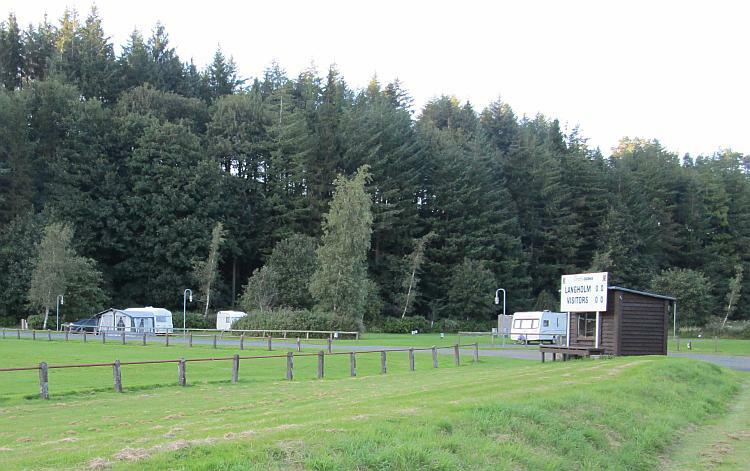 There is a small campsite behind the Whitsheil cafe. I stick my nose around the back and immediately decide against it. It...it...it is...sort of surreal. Just a few ramshackle caravans and a static, no obvious place to pitch a tent and it makes me think of a shady trailer park in an American B movie. I'll head to Ewes Water just a hundred yards up the road. Ewes Water is unusual too, in a more friendly way. A patch of well kept grass offers clean pitching next to a rugby club and rugby pitch. The toilets are beneath the small stands and are always clean if a little dated and basic. This is hardly 5 star luxury. The prices are not 5 star either at £6 per night and considering the clean facilities, the proximity to the pretty little town of Langholm and the sun in the sky I think this is sterling (sic) value. Ewes Water campsite is adjacent to the rugby pitch. Simple cheap and effective. With the tent pitched and a cup of tea in hand I acquaint myself to the only other campers, a couple in a touring caravan. They're from Wigan, just 6 miles from my house, and regulars here due to the cheap prices, cleanliness and relaxing tranquillity of the area. They like a mix of just chilling out right here were they are and short trips out around the locality to walk, dine out or explore. I don't know this area well at all, maybe I should spend more time here as it's easily accessible from home for short weekends or even day trips. Hmmm, worth remembering. I walk into Langholm. After buying some crisps and a chocolate bar I take the time to get behind the main road which proves worthwhile and fascinating. 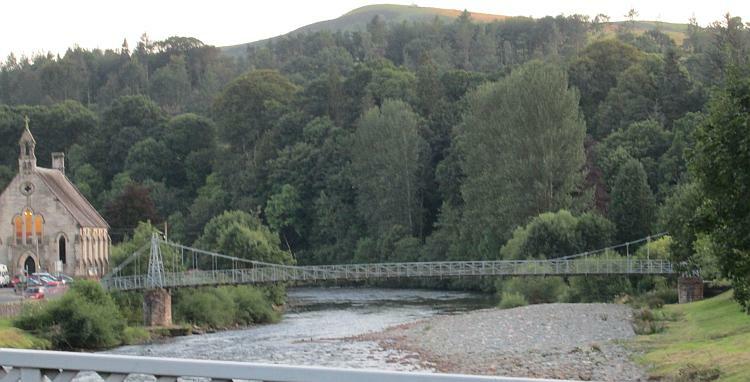 Langholm is on the confluence of Ewes Water (a river), the River Esk and Wauchope Water (another small river). As such there are bridges everywhere. I like water, I like bridges and I like to walk down the back roads behind the houses. On the suspension footbridge I stop to take some pictures when a lady starts to walk across with her dog. The bridge starts to sway and I grab the hand rail. She laughs. Apparently it is fine, you get used to it. I remain a while longer as other people cross to experience it some more. Fabulous. The swaying and bouncy footbridge, Langhom. Back at the tent I settle in for the evening with another hot cup of tea, a game of chess, some internet time and fight with the zip on the inner tent. This tent is getting old and it is starting to show it's age. With the aid of my snips from the tool kit I remove the offending part and wonder just how much I'd be prepared to spend on a new tent. Nothing lasts for ever does it. Pegmonkey! 120 miles in one hour? Are you suggesting that I should break the road laws of this fine country? We have a maximum speed limit of 70 mph on our motorways doncha know. There is one other thing to note - I'm on an overladen 125 with a top speed of 60 if the wind is behind me. Yes, engineers and builders are often overlooked. It makes me laugh because here in the UK if you visit an ancient castle for example the tourist information boards will say something like "This castle was built in 1356 by King X". King X basically sat on a throne and said "Build me a castle here and here". He didn't get his hands dirty. 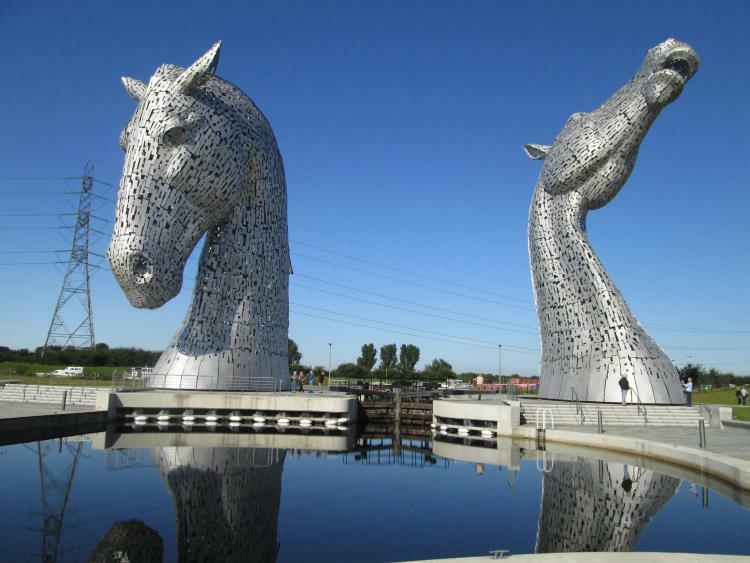 Some artistic type with surreal world views and an emotional angst might have constructed some random meaning behind The Kelpies but a bunch of skilled people had to actually make the darn things. The quality of the construction and the surrounding landscaping is a credit to metalworkers, flag layers, gardeners and waterway engineers. I know you're not a Francophile like me but if you ever dare go across the channel again I suggest visiting the castle at Guedelin - http://www.guedelon.fr/en/ . It's being built from scratch using all the original techniques. Fascinating. There was a very dopy TV programme based there a little while ago but the real thing is well worth a visit.